Are Bookstores Being Too Censorious With Author Events? Jennifer Weiner is a best-selling author. And while her latest novel, Best Friends Forever, proved popular enough to hit #1 on the New York Times bestseller list, this didn’t stop a Barnes & Noble bookstore in Framingham, Massachusetts from raising a censorious eyebrow. Some bookstores have begun instituting informal policies which preclude authors from using four-letter words during a public reading. And even dependable draws like Weiner are being asked to hold their tongues. These developments — reflected most recently in the Weiner case — raise new questions about just how much an author is allowed to get away with in the 21st century and whether bookstore policies that are understandably intended to protect children are going too far. A list of questions was sent to Mary Ellen Keating, Barnes and Noble’s senior vice president of corporate communication and public affairs. But there was no response. I was able to reach Margaret Moore, the community relations manager of the Framingham store, by phone. But she was extremely nervous, even when I assured her that I was merely determining questions of policy. I did receive a return phone call from Maddie Hjulstrom, a regional community relations manager at Barnes and Noble, who was gracious enough to talk with me. 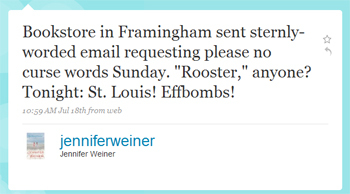 According to Weiner, the Framingham controversy arose out of concerns that the reading area was adjacent to the children’s section and that Weiner’s scheduled reading time — 3:00 PM — would be too early to account for the hallowed ears of tots. This was confirmed by Hjulstrom, who told me that the objections had to do with the microphone’s close placement to the children’s department and the possibility that Weiner’s amplified words might drift like cigarette smoke into a 1980s restaurant’s nonsmoking section. Had Barnes & Noble ever received any customer complaints because of an author or a poet using salty language during a reading? Hjulstrom told me that she couldn’t give me an example of the Framingham store having received a single customer complaint, but that the region, as a whole, had received a few complaints. The Barnes & Noble “no salty language” policy is, according to Hjulstrom, “not a written policy, just common courtesy.” It is something that is determined on a case-by-case basis. I asked Hjulstrom what might happen if an author used salty language, but did not receive a single customer complaint. But the prohibition causes one to wonder why bookstores — even with the possibility of a child lurking around a bookstore late at night — would be so offended by a monosyllabic exclamation that anyone who has ever stubbed a toe is quite familiar with. Were there efforts by Weiner and Barnes and Noble to broker a last-minute deal? Still, independent bookstores such as San Francisco’s The Booksmith have conducted numerous author events in its children’s section, closing the section off to make room for the audience to sit down. Booksmith co-owner Praveen Madan informed me that, while there are generally no kids around at the time of the event, his bookstore doesn’t make any concessions if an event takes place in the middle of the day. It’s also worth observing that prohibitions on what an author can say at a reading can sometimes have unexpected side effects. As Tayari Jones observed on her blog recently, the author can feel oddly shamed when contending with a complaint. Jessica Stockton Bagnulo, formerly of McNally Jackson and now working hard to open the Greenlight Bookstore in Fort Greene this autumn, says that there was never a policy prohibiting language or controversial topics at an author event when she worked at McNally. But she did mention that she hoped to be more sensitive to such matters at Greenlight. Even if the event is scheduled in the middle of the day? “I think that indie bookstores work to create an environment of mutual respect between authors and audiences,” said Bagnulo, “where what is controversial is taken in context as part of the conversation, and there’s enough transparency of intention that people are unlikely to be offended.